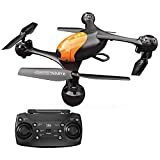 Holy Stone HS170 Drone Review 2019 – is the Holy Stone HS170 quadcopter worth the money? Review of features, pricing, flight duration, battery, camera and more. 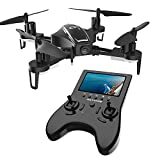 This Holy Stone HS170 Drone is an ideal gift for children or individuals fascinated by remote control quadcopters. This Holy Stone HS170 review is intended to provide you with a better concept of the performance and features of this awesome little quadcopter. The HS170 is of a remarkably good quality when the price point is taken into consideration. The drone has four rotors, with black blades on the back and white ones on the front so the direction it is facing can be quickly identified. In addition, it includes flashing LEDs that have red lights in the back and blue lights in the front on its sculpted polycarbonate body. This gives it an aggressive posture that could easily fool individuals into believing that it is the toy form of a police drone. There are 3 different modes for beginners and more advanced players and it is really very entertaining to fly. Included in the box is a set of replacement blades just in case one gets lost or broken from rigorous flying. Each blade is angled differently; therefore, you should ensure that the replacement is installed properly. Failing to do so will cause the drone to fly improperly and it could even flip over. The Holy Stone HS170 Drone has malleable landing feet that offer cushioning when the quadcopter intentionally or accidentally lands. The springy feet could cause the drone to flip over as it lands, so don’t be alarmed if that happens. Additionally, it has curved propeller guards designed to soften its impact on the ceiling and the walls. These features boost the heftiness of this little device. The look of the remote control is fairly decent and it quite nicely fits into the palm of your hands; there is also no issue with reaching the buttons. However, when the remote control is taken out of the box, you will quickly find that you might not know how the buttons are to be used. There is absolutely no inscription on any of the buttons, except ‘On/Off’ beside the power switch. Looking at the manual will help you to figure out which is which. As usual, the remote control has 2 stick-like buttons that allows the user to control the height and direction of the drone. Though the face of the remote control is quite blank, it response time is more than remarkable. Additionally, there is a headless mode selection and by pushing down and holding the button it will be activated. However, an annoying beeping sound is there to prompt you that the headless mode is active. A fun trick button is also there and when pressed, it will make the drone do a back or a front flip; kids find this option a lot of fun. There are trimming buttons that enable you to make any adjustments necessary to stabilize the flight. The drone lights can be turned on and off when a button is pressed, making it possible to fly in the dark. Though the return to home button works fairly well, at times the drone just stays there or crashes into objects. The high and low selections boost the response of the drone; therefore, it should be operated in high mode to get enhanced performance. The remote control is very comfortable to use but the absence of labels can be a little infuriating. After the battery has been installed into the remote control, the Holy Stone HS170 Drone starts to light up; it is also remarkably silent. 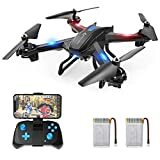 It responds quite well to the controls and its headless mode makes it easy to move around the environment, even for a person who has never flown a drone. Actually, the controls are very responsive and smooth. This mini drone can also do stunts; it is outfitted with 6-axis gyro stabilization. It can do some evasions and a few 360 degrees spins. The difficult part is piloting the drone to “home base” to be recharged. When the well starts to run dry, the drone becomes more and more difficult to control. To prevent this, you should land the drone within 5 minutes of flying and switch the batteries. The HS170 comes with a removable battery that makes recharging easy. Eventually, the battery will worsen but you can order a new one. Check the manual to get the part number. A wire is there that joins the battery to the Holy Stone HS170 Drone, which looks a bit odd and hangs off to the side. However, this does not impact the drone’s performance. It takes roughly 30 minutes for the battery to be charged; it delivers roughly 8 minutes of actual flying time. It is a good idea to get additional batteries so you will not have to stop flying while the battery recharges; in a minute or less you can be flying again. A drone such as the DJI Phantom series is similar to an old Cadillac designed for stability and a smooth ride that ensures decent video footage. However, the HS170 is more like a rally car, testing the skill and daring of the pilot with every turn, obstacle and gust of wind. 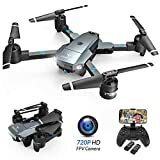 This drone is a great value for the price and it performs remarkably. There are a few negatives, as outlined in the review; however, it comes out ahead overall. It is easy to control, flies well and it can be used by children without any issues. The drone appears small but it is rather robust and delivers a decent responsive performance. It can remarkably handle bumps, falls and crashes. Most importantly, it is lots of fun to fly.